Want to know how to whiten teeth? It’s there. Fix red-eye? Yep. Create an animated GIF? Ditto. Remove objects from the background? Definitely. Smooth wrinkles and blemishes? Yes, you got it. You can browse, jump, and watch anywhere you want within the set of lessons – so you can get a lot out of this great class whether you’re already using Photoshop CC or if you’re an absolute beginner. Downloadable practice photographs and Photoshop (PSD) files are included, allowing you to follow along with the author throughout the course. You will be granted full access to these tutorials so you can learn them at your own pace. IMPORTANT UPDATE: Adobe says they will be removing all the KnowHow courses soon! Be sure to take advantage of them while they last. Bonus! If you’re looking for a more advanced Photoshop “how-to” class (or after you finish this one), then be sure to check out this 13-hour training course, which goes further and covers even more. For customers who are also using Lightroom to manage their photos, don’t miss this Lightroom overview class (70 minutes). Both of those are also free! If you don’t already have Photoshop CC installed on your computer but would like to get started today (and work side-by-side with the lessons), you can easily download the free trial for Windows or macOS – then install, run, and start your training… When your free trial is up, take a look at Adobe’s Photography Bundle, which gives you the latest versions of both Photoshop CC and Lightroom CC – desktop tools which used to cost over $1,000 – for only $9.99/month. And if you also like learning in print, then you’ll love this awesome set of free Adobe books you can download (over 30 different titles to choose from). Another helpful resource for understanding the product is the official manual – free PDF documentation – for Photoshop (or any other Adobe application). What are you waiting for? This in-depth course is 100% free for you with zero downside – so go for it! Please tell your friends and colleagues too, and let us know what you think of the course in the comments below. Adobe Photoshop is the worlds’s #1 photo editing application. This full course is the best way to learn how to use it. We use the latest Creative Cloud version, but if you have a previous version (CS6, CS5, CS4, CS3), you can still learn to edit like a pro. This course is great for Mac and PC users. By the end of this course, your confidence as an image editor will soar. You’ll have a thorough understanding of how to use Adobe Photoshop for fun or as a career opportunity. Lynda.com, by far the leading online training site for Adobe software, now offers over 1,000(!) hours of tutorials on just Photoshop alone – and even better, you can sign up for a free 30-day trial with unlimited access to thousands of helpful courses and instructional videos through­out the entire site – covering technical skills, creative techniques, and much more. KelbyOne – from Scott Kelby of NAPP and Photoshop World fame – is another terrific option for taking your Photoshop, Lightroom and photo­­graphy knowledge further under the tutelage of renowned industry experts and luminaries… Grab this exclusive $20 discount on their unlimited Pro membership, which includes full access to 1,000 different courses and tutorials, plus two digital magazine subscriptions. What do you think of this free Photoshop course? Please let us know below! How do I find the pictures to download for the class? Hi Shonna, while you’re watching the course, look at the icons to the upper right of your screen… There’s a file folder with a download symbol there. 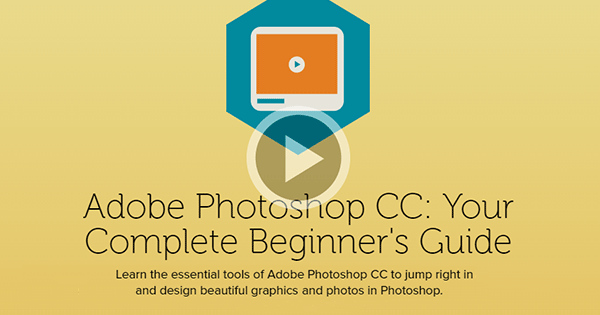 Click that and the Sample Files for the Photoshop course will start downloading. The photos are given in a ZIP file called PracticePhotos.zip. It is very helpful for every man & woman who wants learn Adobe photoshop. My tools aren’t working like his are, and now when I try to move the words, it flashes to a black screen and stays there when I get it moved to where I want it. I can’t wrap text. I’m out of practice and am getting so lost already. Black screen? Not sure at all what you mean. Which version of Photoshop are you using? If you want to quickly wrap text, just hit Enter. If you want to stop entering text, just hit the Esc key. I’m using Adobe CS6. I wish I could take a screen shot to send to you. Do you have any free online training courseware for Adobe Premiere Pro through Creative Cloud? My 14 year old is keen to do some video editing. Please advise – thanks! Greetings David, thanks for your comment. We would suggest the free tutorials for Premiere that Adobe makes available here.